The River Whiteadder rises in the Lammermuir Hills and is fed from this high ground by the Bothwell, Moneynut and Dye Waters. Old Tweed Almanacs indicate that the Whiteadder was previously the foremost tributary of the Tweed. The Whiteadder Reservoir has eliminated the major variations in the flow after heavy rain. At Allanton The Blackadder joins just before the Whiteadder runs into its more dramatic and picturesque section through the high-sided valley in its run to join the Tweed. Hutton Mills Estate is roughly in the middle of this section with a mix of deep holding pools and faster runs. A lot has been done to improve the river and the fishing over the last few years. The first major breakthrough was the installation of a fish pass which has opened up an additional 16 miles of spawning and feed to migratory salmon and sea trout. The North Atlantic Salmon Trust and the Tweed Commissioners have done an enormous amount of work in buying out the netting stations on the Lower Tweed and this, together with the work being done internationally with regard to the Faroe sea fisheries and North Sea drift nets is greatly enhancing the salmon stocks entering the estuary. An improvement scheme to the beat has been carried out with the approval of the Tweed Commissioners, the Tweed Purification Board and Scottish Natural Heritage. The estate has had considerable improvements made to the fishing by installing groynes with further works planned. Please download our Fishing Guide (PDF) for further information. Hutton Mills is offering two day Salmon and Trout guided fishing packages with inclusive accommodation & meals plus guided fishing and casting tuition. Parties up to four anglers can be catered for although the mill itself sleeps eight people so partners/non fisherman are also welcome at an additional charge. Hutton mills estate has nearly two miles of water on the river Whiteadder, the last but one of the foremost tributaries of the world famous river Tweed. Given the correct water conditions the two days fishing will consist of one day on the river Whiteadder and one day on the river Tweed. 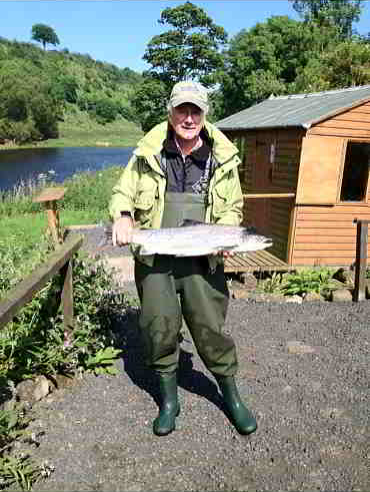 If the Whiteadder water is too low, both days fishing will take place on the Tweed. 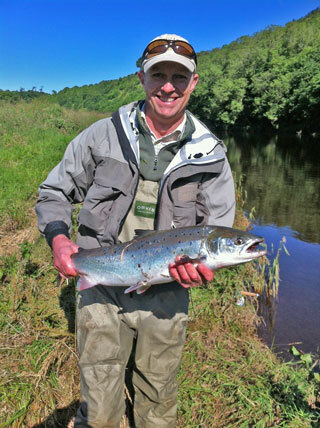 Your guide over the two days fishing will be Carl Hudson, Carl has some 25 years experience in game fishing spread between the Tweed and the Whiteadder. He is a fully qualified casting coach/instructor both with single handed and double handed rods, Spey double/single,snake roll,snap 'T',jump roll,single and double haul are just a few of the cast you could learn or brush up on. Here's what previous guests have said about Carl "Thanks Carl I learnt so much more in the first hour on the river with you than I've learned with other guides in a full day"
"What a fantastic day learning to Spey cast and my first Salmon while doing it,thank you so much Carl"
So why not come fish,learn and enjoy our hospitality? Not to mention that you will be learning in the wonderful and majestic surroundings of the Scottish Borders and the world famous Tweed river system . Hutton Mill fishery is fly only all year round,the beat has thirteen named pools of varying length and is divided into an upper and lower fishery at roughly the half way point.The upper beat pools can be driven to in a 4x4 when the fields are dry,the lower beat is more wooded but is accessible by a good footpath. The fishing at Hutton Mill has been syndicated for the past five seasons, the Mill has retained two rods.These rods are available to let on an intermittent basis of days up to full weeks, for availability and price contact the Hutton Mills Estate Guide - Carl Hudson, who has more than twenty five years experience in guiding and game fishing. Carl is a registered fly casting tutor for beginner up to advanced standard, if you wish to have a guided day at Hutton Mill and would like his services please book in advance.